Item # 316687 Stash Points: 395 (?) This is the number of points you get in The Zumiez Stash for purchasing this item. Stash points are redeemable for exclusive rewards only available to Zumiez Stash members. To redeem your points check out the rewards catalog on thestash.zumiez.com. Read all about it on your new Breaking News Sticker from Flying Coffin. 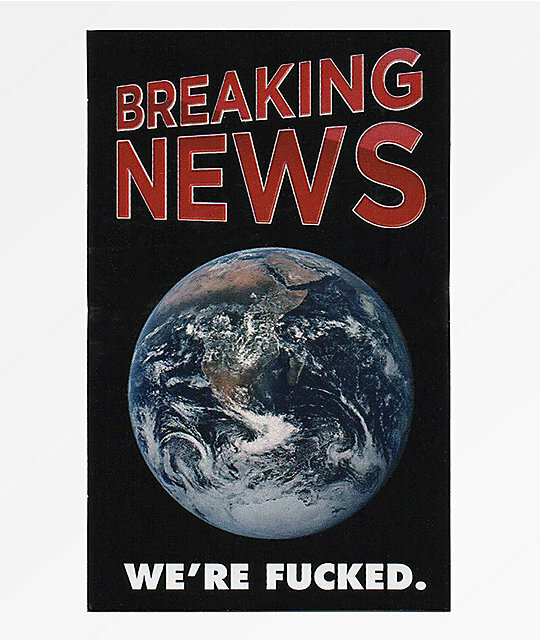 This sticker displays an image of the Earth with text that reads "Breaking News" on top and "We're Fucked." on the bottom. Breaking News Sticker from Flying Coffin. 3" | 7.62cm approx. tall.